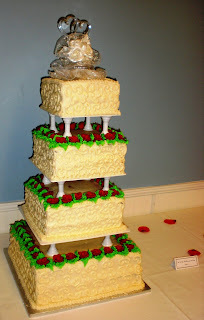 Jonathan & Amy: CS and Trish Got Married!! 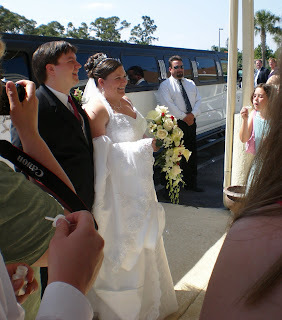 The day before I left Florida, my friends CS and Trish got married. I met CS on my first day of high school. In second period biology (where I was organizing my new backpack a la Tori if anyone remembers that catastrophe), Mrs. Reid called roll, and CS's name was read "CS Scott." He then told the story of how there were two kids in his middle school (CS was one of three kids in the class I hadn't known since 6th grade) with the exact same name, and to keep from being confused, one went by Christopher Steven, the other by CS. This amused me, and to this day I'm pretty much the one one who calls him "CS" instead of "Chris." 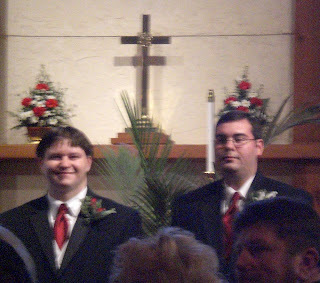 Anyway, we were friends throughout HS and college (we got together for every football game - home and away - for the first couple years at FSU), and I was delighted to be invited to his wedding. I met Trish the summer before she started at FSU, and the three of us got together several times for board games and similar activities during my last year-and-some in Tallahassee. Their proposal story is really sweet, and it involved swimming with dolphins. Since Jonathan was still out west (he was actually flying from San Jose to Denver that day), BK came as my guest to the wedding. 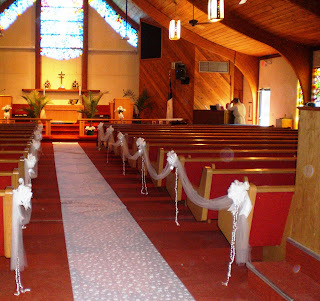 The ceremony was at St. Andrew's Lutheran on Prima Vista, which I'd driven by a ton of times, but had never been in. It's actually quite pretty, with lovely stained glass scenes and a unique ceiling/roof. They used beautiful pew bows (which sometimes is a bit over-the-top, but worked very well for them), and the ring bearer was adorable. 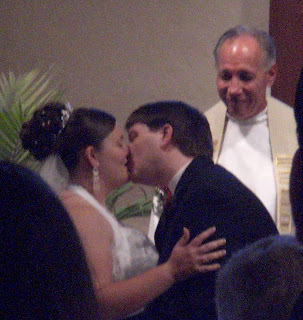 The ceremony was nice and simple, probably about twenty minutes. The message from the pastor was about the different meanings of the word "love" in Greek, which is a concept which has fascinated me since 9th grade English. I adored the train on Trish's gown, the detail was astonishing. I also loved her hairpiece, it was so perfect with the overall look. 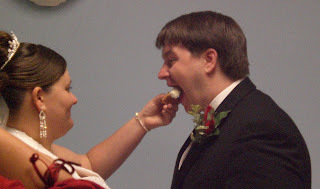 I told BK about it while we waited in line to talk to the bride and groom and their parents. CS's mom seemed to recognize me right away, which surprised me a bit since I've only met her a few times. After we had our five seconds with the happy couple, we headed outside to grab a spot in line to blow bubbles as they exited. 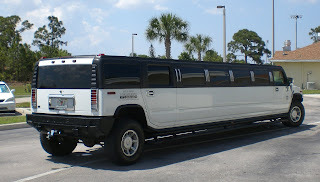 And that's when we got to see the stretch Hummer with congratulatory message. Sweet. From there, we headed over to the Knights of Columbus that is around the corner. After passing out table cameras discreetly, BK and I found our table and then went for appetizers. Cheese and crackers, pepperoni, veggies, and shrimp made for a tasty tide-over. The coke was extra-sweet (as was the sprite I had later), so I was happy. 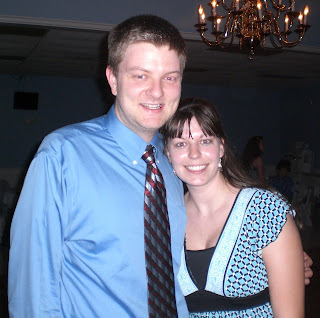 We were sitting with the Matron of Honor's parents, the Best Man's wife, and another couple we didn't really talk to. 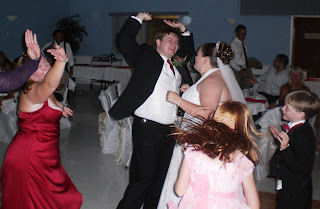 Ben, the Best Man, was CS's roommate in college, so I've met him a number of times, so sitting with Kristin and Ben (when he wasn't at the head table) was a lot of fun. 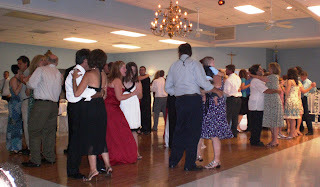 It was a real dancing crowd, which worked out great for me, hehe. 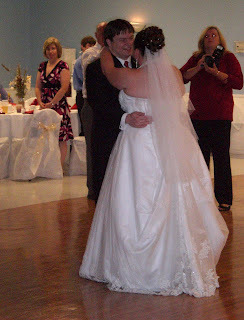 Two funny stories: 1) when they did the "dollar dance" I got up to get in line for CS... but was pulled away by his sister [who was standing in for the MOH (who was having contractions all day) at this point] to dance with Trish instead. So I had to get up again to get in line for CS. 2) they played "New York, New York" toward the very end, and we started a can-can line of sorts. It was highly amusing.